Communities who rely directly on the natural environment for their survival typically have developed risk management strategies to enable them to avoid dangerous thresholds of change to their livelihoods. 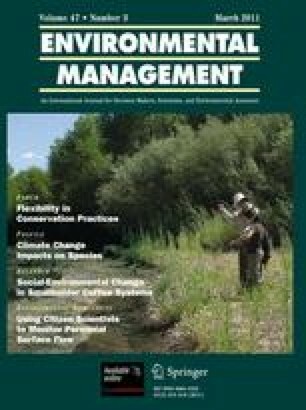 Development policy appropriate for natural resource-based communities requires an understanding of the primary drivers of social-ecological change, the ways in which affected households autonomously respond to such drivers, and the appropriate avenues for intervention to reduce vulnerability. Coffee has been, and still remains, one of the most important commodities of the Mesoamerican region, and hundreds of thousands of smallholder households in the region are dependent in some way on the coffee industry for their livelihood stability. We used the Analytical Network Process to synthesize expert knowledge on the primary drivers of livelihood change in the region as well as the most common household strategies and associated capacities necessary for effective response. The assessment identified both gradual systemic processes as well as specific environmental and market shocks as significant drivers of livelihood change across the region. Agronomic adjustments and new forms of social organization were among the more significant responses of farmers to these changes. The assessment indicates that public interventions in support of adaptation should focus on enhancing farmers’ access to market and technical information and finance, as well as on increasing the viability of farmers’ organizations and cooperatives. The activities reported in this paper were financed by the University of California Pacific Rim Research Program. Any opinions, findings, conclusions and recommendations are those of the authors and do not necessarily reflect the views of Pacific Rim Research Program. The authors are grateful for the contributions and active participation of S Hernández, MV Gottret, H Morales, S Urioste, G Jiménez, W McLaughlin, JF Barrera, R Díaz, C Tucker, D Morales-Hidalgo in the construction of the AHP model. We appreciate the helpful suggestions of three anonymous reviewers in improving this manuscript.